Having cancer isn’t much fun. From time to time I follow a forum where people share their stories of having cancer, or of caring for those who do. Some of these stories are heartbreaking. The pain, the fear, the loneliness, the hopelessness, the cruel and depersonalising invasion of cancer through the body. Once active, strong, happy individuals, being reduced to feeble shadows of their former selves. It’s not just the requests for prayer. It’s also the offers to pray. People will share their struggles and sometimes others reply, saying that they will pray for them. Sometimes people share that they’ve been praying for someone. Sometimes they even share what they’ve been praying. I’ve been overwhelmed by how many people have been praying for me. Many of these I know about. Friends, family, people at church. I’ve been amazed to discover that I’ve got a spot in people’s prayer diaries. Some people have told me they pray everyday without fail – and I believe them. Others have said they pray every now and then, when they think of it. Some pray when they get news or when they read this blog. 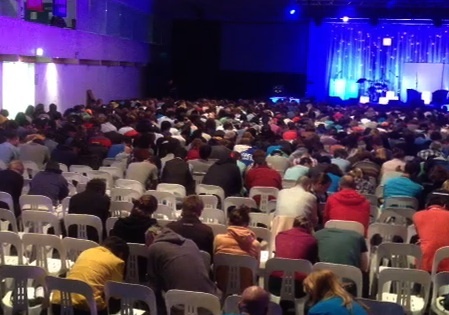 I was remembering tonight, as I visited the NTE conference with around 2000 other people, that 1500 or so students had gathered in small groups to pray for me at the same event last year. Over this weekend I’ve met four strangers who, upon being introduced to me, said that they (and sometimes their churches) had been praying for me all year. A couple of months back I sat beside visitors at church who, when they discovered who I was, said it was so good to put a face to the name because they’d been praying for me for some time. These serendipitous experiences have been happening all year. What a blow out! So many people have been praying. People I’ve never met, who’ve never met me, but who’ve been moved to speak to God on my behalf. I’ve felt so privileged and have been so encouraged by this news. Over the years, and even now, our family has also been praying for others with cancer and serious illnesses. We’ve prayed for my dad, Bronwyn, Peter, David, Judy, Nanette, David, Ed, Jenny, Eleanor and others. Some of these people are in remission, others are still fighting, and some have lost their lives. We also remember their families in our prayers. Sometimes I offer to pray for people I’ve met through forums, facebook, or the blog. I try to pray immediately after I make the offer, so that I don’t forget! Our Heavenly Father is the one who holds our lives in his hands, so it makes enormous sense to speak to him about such life and death issues as cancer. I ask God to heal people, I ask him to heal me, and I ask others to pray for my healing. But I also ask God to work within my heart and mind, to change the way I think and feel about things. I want him to help me trust him, to rely upon his goodness, to treat others with love and kindness, and to hope for eternity in him. God may choose to heal me, and I hope he does, but whatever happens I pray that he will be honoured in my life and others. So please pray and please keep on praying. Not just for me, but for yourselves, for others, for those with cancer, for their families and friends. And don’t limit your prayers to matters like cancer, even if your whole life is consumed by it. God says we can approach him on any matter. Nothing is too big or too small. So let’s pray, not as a last resort, but because God is more willing to do good in our lives than we are to ask him. Clearly God is inviting us to pray, but how long should we keep on praying? If we’ve prayed a few times and it hasn’t been answered, do we continue? Jesus prayed three times that God would take the cup from him. Paul prayed three times for the thorn to be removed from his flesh. Does this suggest three strikes and you’re out? Is it unreasonable for me to pray for the same things day after day after day? Is it wrong for me to request your continued prayers if you’ve been praying for a year already? But did you also notice what these guys were praying about? As huge as cancer is, there are bigger matters still. These are prayers that God will make our lives count, that we will persevere, stand firm, and bear good fruit in our lives. As much as I want you to keep praying for healing for people, including me, who have cancer, I’d ask you to pray for these things even more. Thank you so much for praying, and please don’t stop! Thanks for these words of encouragement. I heard you speak at KYC many years ago and it’s one if the few I can still remember. May God continue to use you to minister to others, and receive ministries back via the web. Thank you for this post and the link to your blog. It amazes me still now many people are praying for me and my family since my diagnosis 20 months ago. I have been prayerful for many years but since dx I routinely take at least 30 minutes every morning in prayer with gratitude for one more day and in praying for those who are ill or in need of God’s peace. It lets me start my day with this feeling of inner peace and connectedness. This site is full of people praying for each other everyday (whether or not it is posted) and it is so uplifting!